Day 2 in Bangkok began with last year’s runners up Carlos Barbosa taking on Club Atletico who suffered a narrow defeat yesterday. This meant the team from Equatorial Guinea needed something from the game to have a realistic chance of qualifying for the semi-finals. The African representative used the same approach as in their first game, sitting back and absorbing the pressure whilst launching rapid counter attacks whenever the opportunity presented itself. This restricted Carlos Barbosa to shots from distance which the ever-impressive Hungarian goalkeeper Marcel was able to deal with. On a couple occasions when Carlos Barbosa were able to create chances in and around Club Atletico’s penalty area, the framework saved the Africans. The teams went into the half-time with the deadlock yet to be broken. In the second half, Carlos Barbosa started lively and a fast break led to a pass to the far post and simple tap in for defender Le to make it 1-0. They would add a second from a similar situation minutes later. This time Arthur was there to clear the ball at the far post only for the ball to fall kindly to Marlon on the edge of the area who slotted it in the corner of the goal. Luck wasn’t on the side of Club Atletico as another attack down the wing was deflected into his own net by Rodrigo. With the side from Equatorial Guinea needing something from the game they employed the fly goalkeeper only to concede two more as there was no-one left to protect the goal. The final result was 5-0. In the second game it was the defending champions Magnus Futsal against Elite Futsal from the USA. Magnus is a team full of stars, both young and old, including two FutsalPlanet World Player of the Years. It was the 2003 World Player of the Year Foglia that opened the scoring with a delightful finish over the outcoming goalkeeper and into the roof of the net. Magnus dominated from the beginning and chances were rare for Elite but they created a glorious opportunity to draw the scores level when Moreira missed an open goal from a few meters out. Marcel, who looked lively all night, got the second after playing a give and go with Leandro Lino and then sliding the ball under the helpless goalkeeper. It was 2-0 at the break but within the first minute of the second half Rodrigo added a third from a free-kick. A fourth was added by Lino whose silky skills were on show throughout the encounter when he ran from within his own half and slotted the ball in the back of the net. It would finish 9-0 as Foglia and Lino got 2 more each, the first for his hattrick and the latter to make it 4 goals for him on the night. 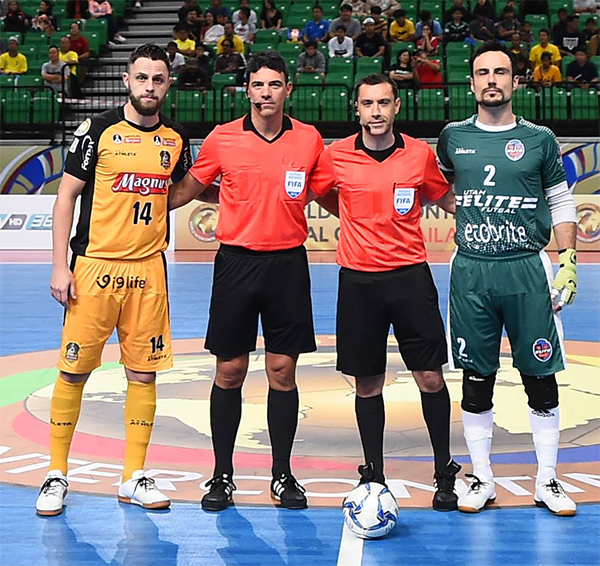 With both Club Atletico and Elite Futsal now destined to face each other in the 5th/6th Place Playoff, the games on Day 3 will decide the make-up of the semi-finals. First up will be Magnus against FC Barcelona, a repeat of the semi-final in the last edition, and this will be followed by the home team Chonburi facing Carlos Barbosa.